OHIO VALLEY — Hopewell Health Centers (HHC), a federally qualified health center (FQHC) and community mental health center providing services throughout Southeast Ohio, will celebrate its five year anniversary on Sunday (today). HHC has clinics spread out in nine counties throughout Southeast Ohio and serves a total of 19 counties through opportunities in early childhood training and school-based services. Since its founding in July 2013, Hopewell Health Centers has grown into one of the most diverse federally qualified health centers in Ohio. In 2017, HHC saw a total of 33,268 unique patients across primary care, dental care, behavioral health treatment, substance use treatment, and allied health services (speech-language therapy, occupational therapy, and nutrition). To date, HHC currently employs over 620 staff members. Motivated by a simple vision to integrate primary care and behavioral health to better serve residents in the region, Hopewell Health Centers has grown beyond this to include other health and wellness supports such as dental, nutrition, peer support, medication assisted treatment for opiate addiction, a recovery house, supportive employment for patients, and comprehensive early childhood services. “One constant throughout Hopewell’s five years is a focus on developing innovating solutions to fill healthcare gaps in the communities we serve,” Mark Bridenbaugh, Hopewell’s CEO. 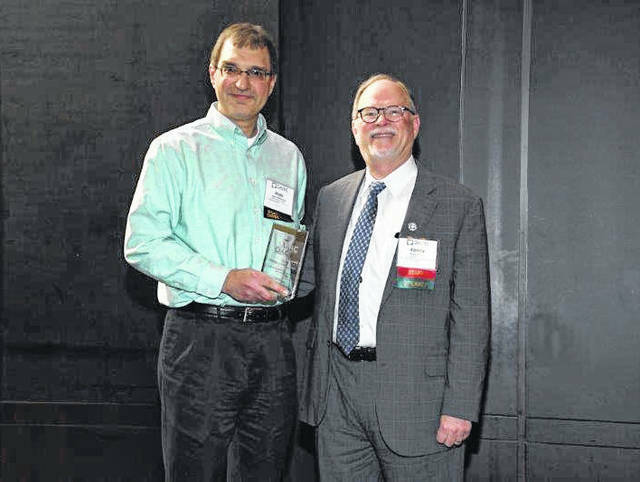 Bridenbaugh was the recipient of the CEO of the Year from the Ohio Association of Community Health Centers (OACHC) as a result of all his work to create integrated healthcare services at HHC. * Reached 94 percent overall patient satisfaction. The mission of the organization is to provide “Access to Affordable, High Quality, Integrated Health Care for All”. Great strides to continue to increase access to care were made recently when HHC merged with Woodland Centers, Inc. (WCI) effective Jan. 1, 2018. This partnership expanded HHC’s services to Gallia County, increased staff by approximately 100 employees, and expanded access to an additional 4,000 patients. In honor of its five year milestone, the agency is not only celebrating its accomplishments with their staff, but looking ahead for the future. This fall, HHC will be relocating The Plains Primary Care Clinic to the newly formed Mary Hill Center in Nelsonville. This relocation will include a new 12-operatory dental clinic, as well as a joint venture with Integrated Services to offer Behavioral Health in the same location. Another exciting partnership opportunity has risen with Hocking College, which involves the development of a dental hygiene program at the Perry County Branch campus. Further, HHC initiated a contract to provide behavioral health services for Hocking College students. HHC currently has two locations in Meigs County — Primary Care and Dental at its location on Pomeroy Pike and Behavioral Health at its East Memorial Drive location in Pomeroy. In Gallia County, HHC operates Gallipolis Behavioral Health on State Route 160 in Gallipolis. Like us on Facebook at Hopewell Health Centers to learn more about services offered, upcoming events, community involvement, and employment opportunities.